This summer, I discovered a wonderful vinegar recipe to use up the few pints of hand-picked strawberries that were left after we ate our bellies full. I have been using the vinegar several times a week for almost three months, so I suppose I got my money's worth, but I am so sad to see it nearing its end. I just may try it with supermarket berries this winter. I don't think I can wait eight months for a fresh supply! 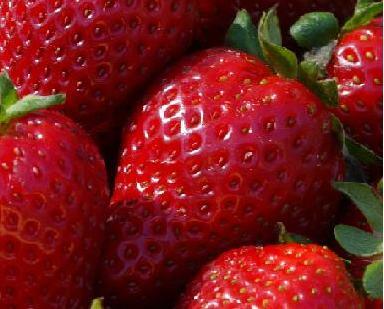 Clean the strawberries and cut them in half. (Cut them in quarters if they're large.) Place the strawberries in a large non-reactive bowl (glass is good). Pour the vinegar over the berries so they are mostly covered. Let the mixture sit for about an hour at room temperature. I love this. Yumm. And the berries themselves are delicious that way. It is yum! And here is a great dessert recipe you can make once you've got the vinegar on hand. I am a real chocolate dessert fan, but this recipe really competes!